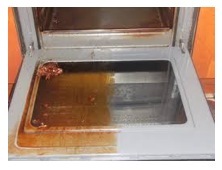 CARBO 300 removes baked on carbon, grease and other deposits from plant, machinery, ovens, grills, baking equipment, tools, utensils, walls, floors and many other hard surfaces. The thixotropic formulation of CARBO 300 ensures easy application to vertical surfaces and increased residency to allow greater penetration of burned on food deposits. CARCO 300 will not taint and leaves equipment odour free. CARBO 300 can be diluted with up to 300 parts water depending upon the degree of soiling. Ideal for use by hand application or, through automatic and power washing equipment. Brush, spray or dip parts to be cleaned, allow the solution to penetrate and rinse off with hot or cold water. Brush / spray application: Neat – 30:1, Dip tank 5:1 – 30:1, Pressure washing and steam cleaning 100:1 – 250:1 PRECAUTIONS: Do not use on aluminium.